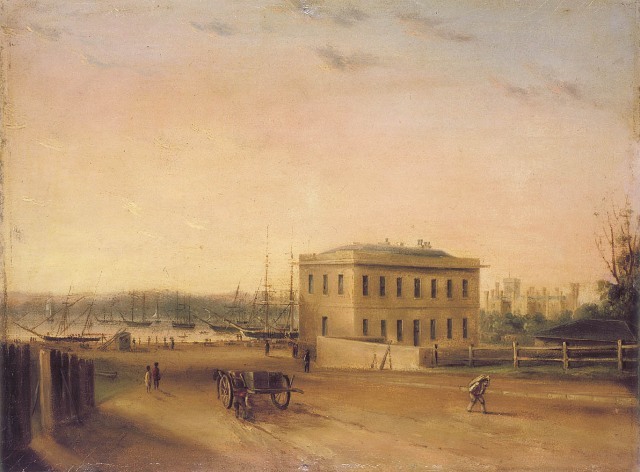 Custom House & part of Circular Wharf, Sydney N.S.W., 1845 / painted by G. E. Peacock. Image No. : a128019, Courtesy State Library of NSW. 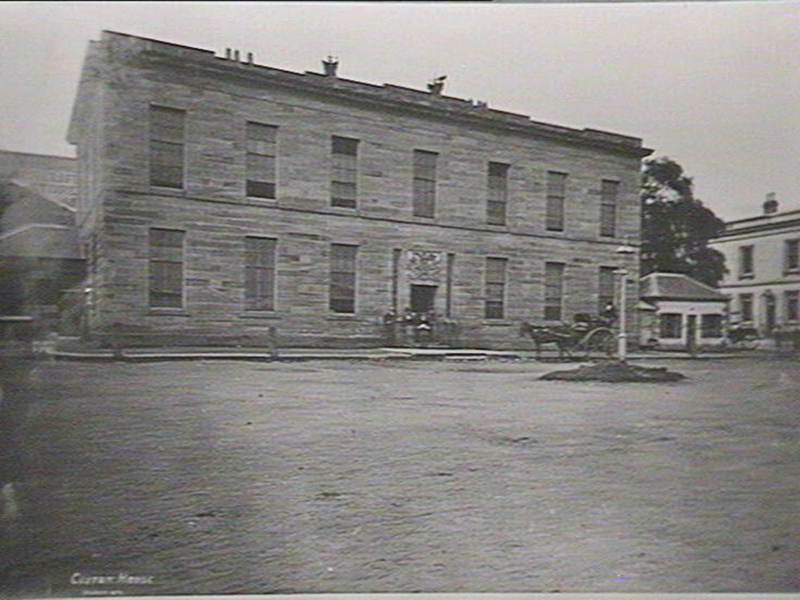 Customs House, Circular Quay, Date of Work: Nov 1870, Image No. : d1_05642 Courtesy State Library of NSW. 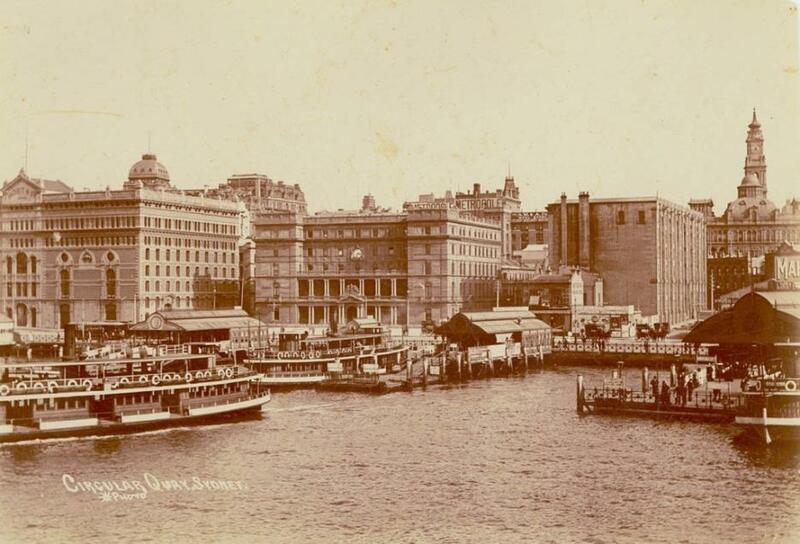 Customs House, Circular Quay Dated: c.1900, Courtesy State Library of NSW. The Customs House was built in 1845 on the site of the landing of the First Fleet in Sydney Cove. Unfortunately Circular Quay, an area of great significance in the history of European settlement in Australia, has been disfigured by the Cahill Expressway which separates the ferry wharves from buildings which in earlier times were on the waterfront. Designed by Colonial architect Mortimer Lewis in the Greek Revival style Customs House was originally two-stories high. It was partially dismantled and then expanded to three levels under the supervision of the then Colonial Architect James Barnet in 1887. Over the years major additions have resulted in changes to the Classical Italianate and later French Neoclassical styles. Early pictures show the Customs House much closer to the water than now. The original shoreline of Sydney Cove was heavily wooded and deeply indented at the south western corner by the Tank Stream. To overcome problems of tidal influence and large mudflats sea walls were constructed in the early nineteenth century and the mud dredged. Walking around Circular Quay today markers can be seen set in the pavement indicating where the shoreline was at various times. For many years the Customs House was dwarfed by the Mort and Company wool store (now replaced by the AMP Building) across Young Street to the East. 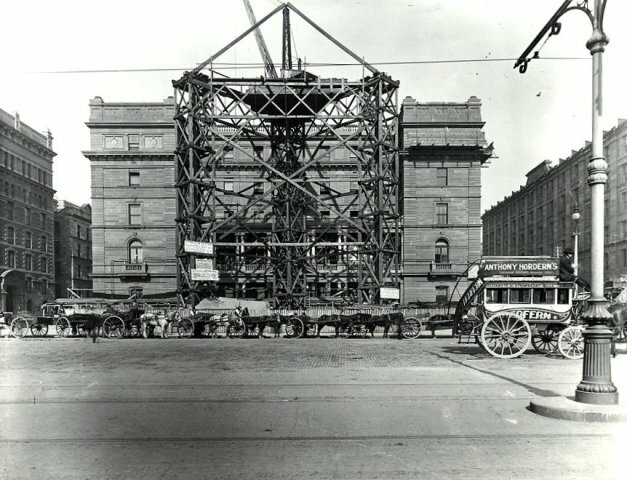 For 150 years it was not only the primary trade gateway for goods and people flowing into Sydney but it, and the square in front, provided a focus for many national celebrations. 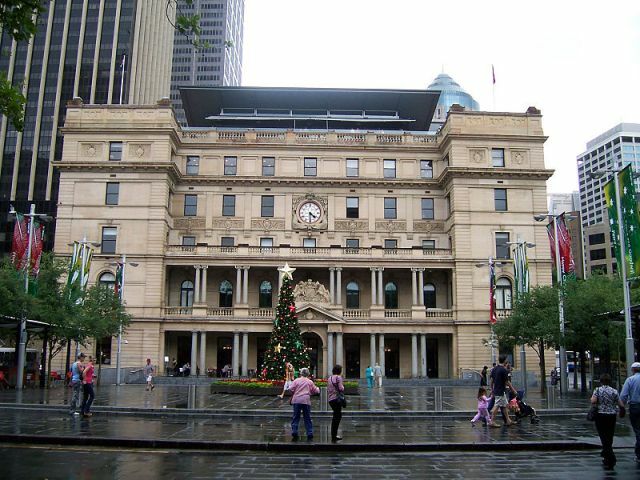 It is one of Sydney’s historic landmark buildings and has featured in the working and cultural life of the city. 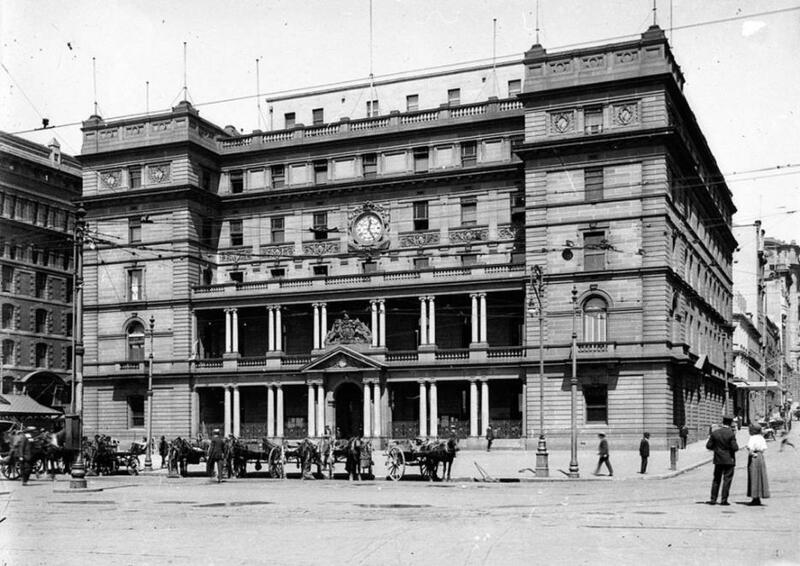 Until 1990 Customs House was occupied by the Australian Customs Service. In 1994 it was given by the Federal Government to the City of Sydney which refurbished it to create an exciting new role for what is one of the City’s most treasured heritage buildings. The refurbished grand entrance atrium provides a ground floor open place where people can meet, peruse books, look at magazines, read local and international newspapers and access the internet. A feature which fascinates children and many adults, is a 4.2m. by 9.5m. 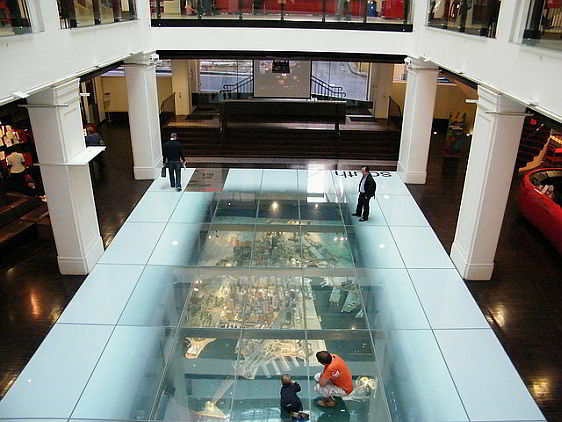 model of the Central Business District of Sydney set under a glass floor. The model weighs one tonne. The flagship Sydney City Library, which in the past was in the Queen Victoria Building, is now in Customs House with a spacious reading room on an upper floor. Upper floors also feature an exhibition area and private function spaces for hire. The first exhibition held in the exhibition space was Coffee Customs in 2005 which proved a great success. It was followed successfully in 2006 by Memory Lane – Recollecting Rowe Street. Changing programmes now promote greater awareness of how Sydney’s future is planned and include multimedia displays, audio and video presentations and architectural models. Customs House is well worth a visit. There is a coffee shop on the ground floor and Café Sydney a restaurant offering haute cuisine, with outstanding views over the harbour, on the roof. It is easily accessible by trains, buses and ferries – and is open seven days each week (until midnight on weekdays and Saturdays). Copyright George Repin, 2012. All Rights Reserved. 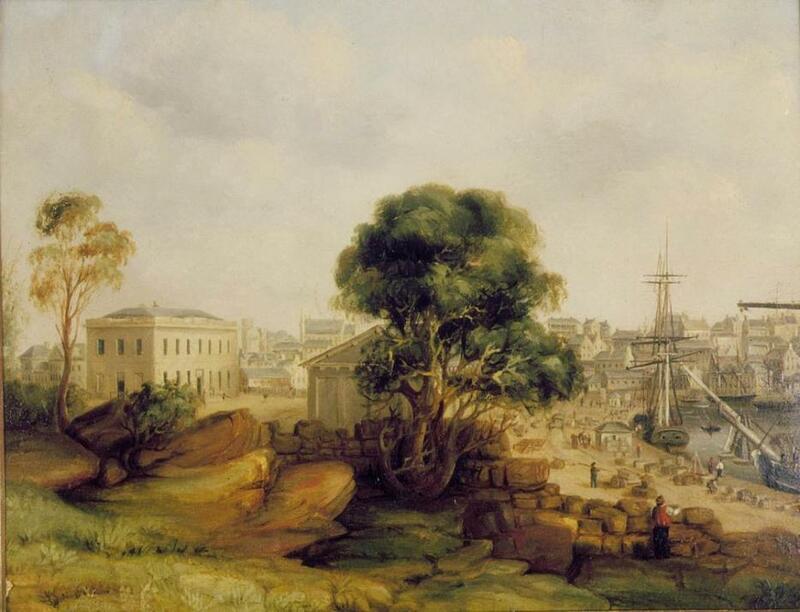 Custom House & part of Circular Wharf, Sydney N.S.W., 1845 / painted by G. E. Peacock, Image No: a128019. Courtesy State Library of NSW.